WEST MELBOURNE — Gary Howell wanted to be one of the first users of the new section of St. Johns Heritage Parkway when it opened Thursday morning. Howell got his wish, zipping along the 3.1-mile stretch on his 1969 Honda 350 motorcycle, just as the new section of the parkway opened at 9 a.m.
"It wasn't necessarily important to be the first," said Howell a Palm Bay resident. "It's just about coming out to celebrate the opening." 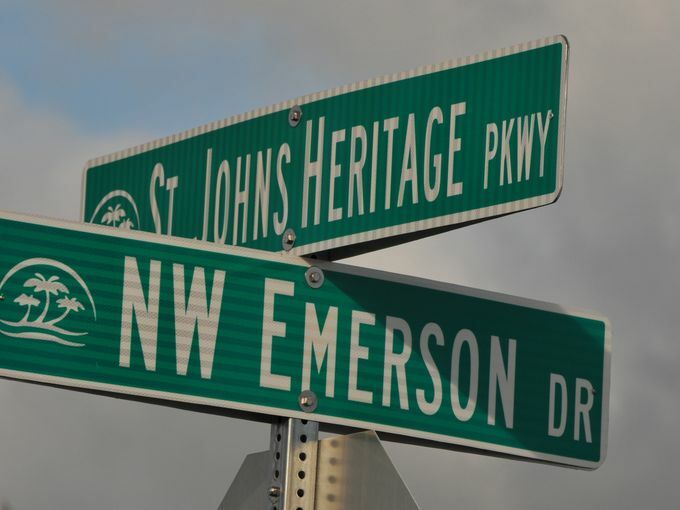 Thursday's opening of the latest segment comes about 2 1/2 years after Palm Bay officials opened the first 2.5-mile stretch of the St. Johns Heritage Parkway, which goes from Malabar Road northward to Emerson Drive. The new segment of the parkway links Emerson Drive with U.S. 192, creating an alternate route for Minton Road commuters headed to and from Palm Bay, West Melbourne, Melbourne and unincorporated Brevard County. About 50 people, mainly officials from Brevard County and the cities of Palm Bay and West Melbourne, held a small ceremony on the side of the parkway, just south of U.S. 192 to note the opening of the new segment. "There have been a lot of people over the years that have brought us to this day," said Brevard County Commissioner Kristine Isnardi, whose District 5 includes the parkway. Isnardi also is a former Palm Bay City Council member who was involved with the parkway's progress over the years. The new 45-mph parkway segment cost $12.5 million, and construction was managed by Brevard County. Thousands of feet of leaking stormwater pipes plagued the project, which was supposed to open to traffic by mid-April. Engineers determined the leaks were caused by a manufacturing issue, and the subsequent underground pipe repairs have a 25-year warranty. To the north, the Florida Department of Transportation is completing right-of-way acquisition for the Ellis Road interchange. Construction should begin in fall 2018, said Georganna Gillette, Space Coast TPO transportation program specialist. "I look forward to the path north," Isnardi said. Relief is coming for thousands of drivers as a southern Brevard County roadway project nears completion after two decades. Officials expect thousands to use the St Johns Heritage Parkway daily, easing congestion on area roadways and the interstate. The road will eventually link Palm Bay, Central Florida's second largest city, with Melbourne, West Melbourne and State Road 192. "We've pushed for this for a long time," said Palm Bay resident Doug Wigner. Locals like Wigner are excited about the parkway. He's lived off Pace Drive for nearly 30 years. During that time, he's championed for the beltway around I-95 to be built, sitting on the project's original citizen's advisory board and attending Palm Bay council meetings. "There's a terrible intersection down here, Jupiter (Boulevard Northwest) and Malabar Road, people are sometimes backed up 30 (to) 45 minutes," Wigner said. The parkway runs north and south in western Palm Bay. This first $12 million phase leads from Malabar Road near Heritage High School up to Emerson Drive, with Pace Drive intersecting with the parkway as well. Nancy Flach is looking forward to saving 10 minutes of driving with her four kids to get to Palm Bay Regional Park. "We will use this as our main road," Flach said. "Beyond the congestion, there's a huge economic development impact to that, people trying to get to work and get their kids to daycare and school. Time is money," said Brevard District 4 Commissioner Andy Anderson, who has worked for years on the project. Phase two of the parkway is now in the county's hands, running three miles north of Palm Bay to SR-192 and then another two miles to create a new I-95 interchange at Ellis Road. Another interstate exit is also planned for south of Palm Bay. The parkway is expected to bring more business development in the area and more jobs. It will also be a key way for residents to evacuate during hurricanes. If all goes as planned, the entire project should be complete by 2017. 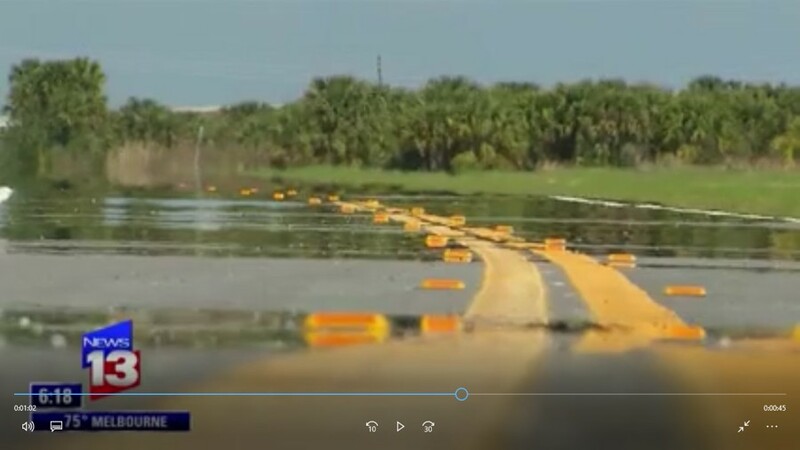 PALM BAY, Fla. - Brevard County leaders on Tuesday officially opened a highly anticipated roadway that is expected to alleviate traffic in southern Brevard County. The St. Johns Heritage Parkway project has been watched closely by folks who live or work in Palm Bay, West Melbourne and Melbourne. "It's time for this road to open," said Phillip Coombs. Coombs lives in Palm Bay and knows what it's like to hit a traffic jam around Central Florida's second largest city. "It gets so congested out here when people are going to work in the morning around rush hour," said Coombs. "It gets ridiculous." But he hopes that'll change now that the first phase of the parkway is finished. Once all the way finished, the 22-mile-long parkway will loop around Interstate 95 north of U.S. 192 and south of Grant Road. Officials think the beltway will help with traffic problems as well as serve as a north-south evacuation route. "I thought about hurricanes," said Joe Krastel. "Where I live I'd have to jump on 95, go up to 192, or stay on 95 and go forever. Here, this is great, you can evacuate the whole west section of Palm Bay and get right down to the extension on Emerson." However, getting to this point didn't happen overnight. It took some key federal grants, and city, county and state funds to get here. Brevard County Commissioner Andy Anderson says it's been over 20 years in the making and he's excited to see the first section of the $23 million project finally finished. "I didn't have gray hairs when I started this project. Now I have a little bit of gray, but it's worth it," said Anderson. The second phase of the parkway is expected to be completed by 2017. PALM BAY – Early in his career as an engineering consultant, Brevard County Public Works Director John Denninghoff helped write the initial 1993 feasibility study for an unfunded, faraway-future road project: the St. Johns Heritage Parkway. More than 20 yaears later, the first 2.5-mile portion of this western beltway looping around congested Palm Bay has finally opened to traffic. And when finished —someday — the road will link with new Interstate 95 interchanges near Melbourne International Airport and Micco Road near Grant-Valkaria. "When it is open and we get it from Malabar Road to an interchange on I-95 up at Ellis Road, we're going to take about 13,000, 14,000 trips a day off of I-95," Denninghoff said Tuesday during a road ribbon-cutting ceremony. "If you think that's not significant, that's about 20 percent of existing traffic that's on I-95 right now. So it's a substantial road improvement. It's not just an evacuation (route). It's not just a new corridor. It is serving the people who live and work in Brevard County each and every day," Denninghoff said. About 150 people attended the St. Johns Heritage Parkway ceremony at the western terminus of Emerson Boulevard. Organizers set up a portable stage, tent, lighting and video monitors on the fresh asphalt. The city of Palm Bay completed the first portion of parkway, which leads southward to Malabar Road just east of Heritage High. Construction kicked off in October 2012. Cost was $13.4 million, including $7.5 million in federal dollars, a $4 million state grant and city transportation impact fees, said Elia Twigg, Palm Bay public works director. Minutes after the ribbon-cutting, dignitaries grabbed shovels and gathered around a mound of brown dirt for a groundbreaking ceremony for the next section of roadway. This 3.1-mile segment will extend the parkway to U.S. 192. Managed by Brevard County, construction should cost $12.2 million and last 720 days. "If you look that way, that's the next connection," Palm Bay Mayor William Capote told the crowd, pointing northward with his left hand. "And that brings the hope to this community. The hope of prosperity. And that is the reality. "We have arrived, Palm Bay. And we're making a statement in the southern end of Brevard County," Capote said. The 45 mph parkway is expected to alleviate northwest Palm Bay traffic jams and improve vehicle access to the airport, Orlando and points elsewhere. Dozens of grazing cows, buzzing insects and barbed wire fences lined the uninhabited pastureland along the parkway Tuesday afternoon. A few pedestrians strolled along the new sidewalk, which is dotted with occasional "Caution: Alligators May Be Present" warning signs. "The big benefit that just happens because of this road is positive economic development," County Commissioner Andy Anderson said. "This is going to serve as not only as a corridor for people who live in Palm Bay and work in Melbourne, to get to work a little bit faster, save a few more dollars in gas and child care. "But hopefully now and in the future, we'll have a little bit more land to build and attract new businesses," Anderson said. 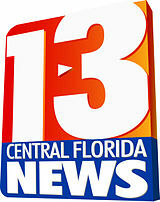 Contact Neale at 321-242-3638, rneale@floridatoday.com or follow @RickNeale1 on Twitter. See other stories by FLORIDA TODAY's Rick Neale at http://tinyurl.com/ossgc3b. BREVARD COUNTY • PALM BAY, FLORIDA – Two years after construction began the city and its partners are preparing to open the new parkway, a critical north-south evacuation route that is expected to ease traffic congestion on the northwest side of the city. 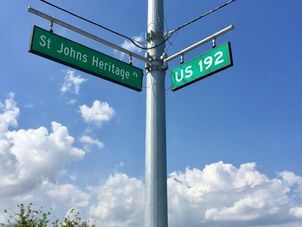 The St. Johns Heritage Parkway will officially open following a ceremonial ribbon cutting that will take place on January 13 beginning at 4 p.m. The ceremony will take place at the intersection of the Parkway with the west end of Emerson Drive. This is also where Brevard County will break ground for phase two of the project which will extend the roadway to U.S. 192. As the county builds this phase of the Parkway, the city will also construct the portion of the Parkway from Emerson Drive north to city Limits, which will fully connect both the city and county phases of the roadway. The St. Johns Heritage Parkway acts as beltway around I-95 providing for a 13,000 interstate trip reduction, reducing local traffic and commercial traffic conflicts on the interstate system. The project connects employees with employers, including several Fortune 500 federal contractors. The proposed roadway promotes long term job creation with new or improved access to 1,400 acres of vacant mixed-use property. In addition, the project allows for a new north-south arterial roadway which connects to several east-west arterial roadways that act as evacuation routes for coastal high hazard areas and for other potential man-made or natural disasters. The city phase of the St. Johns Heritage Parkway is a $12.1 million investment using a combination of federal funds, a grant from the Florida Department of Economic Opportunity and local transportation impact fees. Phase one is approximately 2.5 miles beginning at the west end of Malabar Road near Heritage High School and ending at Emerson Drive. There are two connections—one at Emerson and another at Pace Drive both of which were extended to intersect with the Parkway. “We are so excited to finally be opening the parkway,” said Mayor William Capote. The city phase of the Parkway was a design-build project with Community Asphalt as the primary contractor and Keith & Schnars as its design team partner. The Parkway design was based off of the 100 percent concept plans provided by B.S.E Consultants. Target Engineering performed the project administration, construction engineering and inspection services for the city. The Brevard County portion consists of two phases. Phase I begins where the city’s construction ends at the city limits and runs north to US 192 approximately 3.1 miles. The total construction cost including rights of way acquisition and mitigation is just over $17 million. Construction will begin in early 2015 and last 720 days. Phase II begins at US 192 and runs approximately 2.196 miles north to the proposed Ellis/I-95 interchange. The total construction cost for Phase II is approximately $13 million. “This road has been over 20 years in the making and to see this first section open is very exciting,” Commissioner Andy Anderson said. Future expansion plans will have the parkway wrapping around the southern portion of Brevard County starting at a new I-95 interchange proposed at Ellis Road near Melbourne and West Melbourne and ending at another new interchange near Palm Bay’s southern city limit. Funding for the southern interchange is in the Florida Department of Transportation’s five year work plan and construction is expected to begin in 2016. The city is currently working with the landowners in this area for the design and construction of the south parkway and interchange access roads. An extra $3 million from the state should help keep plans for a road to connect Palm Bay and Melbourne International Airport on track. The Florida Department of Transportation grant will go toward building a 3.1-mile segment of the St. Johns Heritage Parkway from Palm Bay to U.S. 192, while freeing up county money for another phase of the project. “We have enough funding to probably do that segment between Palm Bay and 192, but we want to make sure we have enough money for the overall project,” County Commissioner Andy Anderson said. The entire parkway project will create a highway west of Interstate 95 with interchanges at Ellis and Micco roads. Transportation planners anticipate the parkway will reduce traffic on I-95 and improve mobility for Palm Bay residents. “Any time you can take traffic off the interstate and make travel more convenient for local motorists is a win-win,” said Georganna Gillette, transportation program specialist for the Space Coast Transportation Planning Organization. Brevard County plans to begin construction of the Palm Bay-192 section in October. That segment is expected to cost $16 million. The next phase would run between U.S. 192 and Ellis Road. Parkway advocates expect the state grant will make county money available to help pay for right-of-way land acquisition north of U.S. 192. Construction of a $44 million interchange for I-95 and Ellis Road is expected to begin in the summer of 2016. Planners must still determine how to solve drainage and right-of-way issues before proceeding with the widening of Ellis Road. When completed, Ellis Road is expected to relieve traffic congestion on U.S. 192 east of I-95. The parkway is expected to link workers in Palm Bay with jobs in the vicinity of Melbourne International Airport, where companies such as Embaer Executive Aircraft and Northrop Grumman are expanding operations. Anderson is confident the $3 million state grant will allow the county to move forward with the 2.2-mile section of the parkway north of U.S. 192. BREVARD COUNTY, FLORIDA – A $3 million TRIP grant received from the Florida Department of Transportation will help fund Brevard County’s Phase I construction of St. John’s Heritage Parkway, from U.S. 192 south to the Palm Bay city limits, starting this fall. Construction of the nearly 3.1-mile segment of the parkway is targeted to begin in October. Total cost of construction for Phase I is estimated at $16 million. A second phase, estimated at nearly $14 million, will eventually complete a 5-mile arterial roadway from Palm Bay City limits north to Ellis Road. 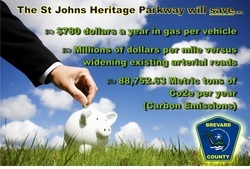 St. John’s Heritage Parkway is expected to serve as a beltway around Interstate 95, reducing traffic on the interstate while accommodating local motorists employed by several Fortune 500 contractors. It’s anticipated the parkway will spur future residential and business development in South Brevard, and the north-south arterial roadway will connect to several east-west arterial roadways that would service as evacuation routes for coastal high-hazard areas and for other potential man-made or natural disasters. An additional 3.2 miles of the parkway, funded by the state and city of Palm Bay, is already under construction from Malabar Road to the Palm Bay city limits. The Transportation Regional Incentive Program grant was the result of a team effort by the Brevard County Board of County Commissioners, Public Works finance staff, the Space Coast Transportation Planning Organization and the local citizens group, Friends of the Parkway. The project is expected to be advertised for construction bids in August, with awarding of a contract anticipated by the Board of County Commissioners in September and construction getting underway in October. Rex Mullen faces a traffic ordeal whenever he ventures far from his home on the southern edge of Palm Bay. "I have to go through about 15 lights to get up to the mall," said the 69-year-old Mullen, who lives in a Waterstone housing development off of Babcock Street. He contends with traffic and other time-consuming delays just to reach Malabar Road and Interstate 95. "If you go anywhere in the morning or late afternoon, there are about six school zones you have to go through on Babcock." He hopes that will change when a section of the Palm Bay Parkway is built with an I-95 interchange halfway between Babcock Street and Micco Road. The first phase of the project will connect the new interchange with Babcock Street, and another section that would link the interchange with Micco Road would be completed later when transportation planners determine it is necessary. The complete four-mileproject is estimated to cost $101.8 million, according to the Florida Department of Transportation. Construction of the interchange could begin as early as the summer of 2016 and open in 2019. FDOT will present plans at a public hearing for its project development and environment study at 5 p.m. Tuesday at Sunrise Elementary, 1651 Mara Loma Blvd. in Palm Bay. The intersection will be a partial cloverleaf design, providing a loop for northbound vehicles to merge onto I-95. The owners of 14 parcels of land plan to donate more than 180 acres of right-of-way valued at $20.3 million for the project. However, there are no businesses or residences to relocate. Transportation planners have drawn a corridor between Babcock Street and Micco Road that provided the shortest length and the least impact to wetlands and wildlife habitat, said Mary McGehee, FDOT project manager. The project, which is near the Micco Scrub Sanctuary and Grant Flatwoods Sanctuary, will have an impact on about 24 acres of wetlands, a direct effect on the Florida scrub jay and potential direct effects on the eastern indigo snake and gopher tortoise, according to FDOT documents. Although FDOT would prefer to build roads in a straight line, meandering roads will connect with the interchange to avoid environmentally sensitive areas. "We had to work through this and try to minimize all these impacts," McGehee said. "There are a lot of scrub jay sanctuary property in this area. The tweaks and maneuvers go around these issues." Transportation planners expect the new access to I-95 will encourage economic development in southern Brevard County and ease traffic congestion on local roads as well as the Malabar Road interchange. Last year, more than 3,300 vehicles daily traveled along Babcock Street near Micco Road, while more than 7,000 used Babcock farther north near Grant Road. In addition to relieving existing traffic congestion, there are also plans for community development, featuring a mixed-use downtown setting. Palm Bay's Emerald City project would surround the interchange with 3,500 homes as well as retail shops, office buildings, medical facility and a business and technology park. "We definitely have a transportation demand," McGehee said. Mullen looks forward to the interchange and the completion of the Palm Bay Parkway, which will give him more choices. "I'm not sure which way it is going to help us most, it depends on where we are going," Mullen said. "I think it will help the overall area and probably stimulate growth. That should help the economy." 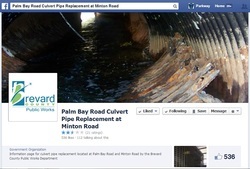 Click here to track the progress of the pipe repairs near Minton and Palm Bay Road, known as "Carmageddon," through Brevard County Public Works' Facebook page. 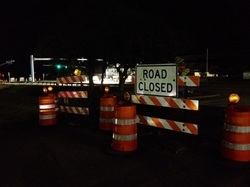 Crews set up signs blocking traffic on Palm Bay Road late Monday night as they prepare for a major repair project that's expected to snarl traffic for at least two months. A collapsed steel storm-water drain pipe will trigger lane closures along a half-mile stretch of the commercial thoroughfare between Minton Road and Norfolk Parkway, the street leading through Hammock Landing shopping center. "I've been dreading it because it's going to cause more traffic for me going to work," said commuter Edwin Bonilla. "I have to go all the way around now to get to Interstate 95, instead of coming here to Minton Road." Brevard County Public Works said the project will cause "Carmageddon," saying gridlock around this portion of town is inevitable. Officials estimate roughly 70,000 motorists travel the affected area on weekdays, and most of the traffic will be detoured on Norfolk Parkway, which is only a two-lane road. Crews hope to have the project completed by June 11, in time for the rainy season and hurricane season. 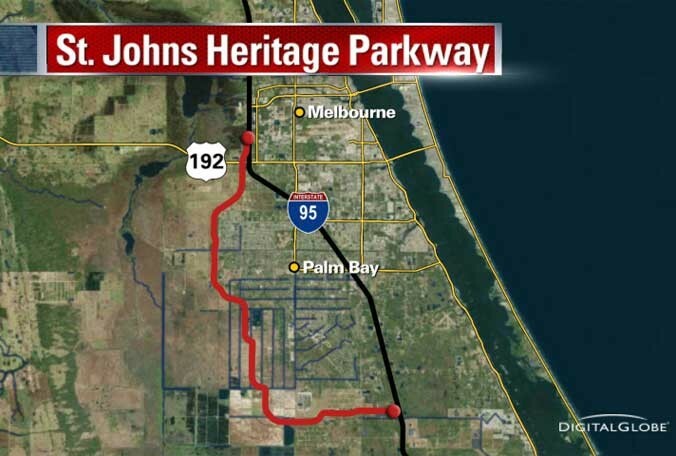 Brevard County will receive an additional $3.1 million in federal fund for the St. Johns Heritage Parkway, an extra infusion that some officials say help make construction on the long-awaited road a possibility for this year. County commissioners today will vote to accept the money, which was surplus from other federal road projects and can be spent only on acquisition of right of way for the parkway. Another measure would come back to commissioners later on spending this money to actually acquire the land. But that extra federal contribution frees up local money for construction that otherwise would have been spent on buying land for the parkway. 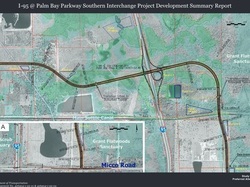 The county’s leg of the parkway would run from a proposed Interstate 95 interchange at Ellis Road to Palm Bay, where construction has already started on the parkway, known as Palm Bay Parkway inside the city limits. Brevard County would need about $13 million to acquire the land needed for the entire stretch of the parkway, Denninghoff said. It already had $4.7 million set aside for acquisition before the new federal funds. It will take about $23 million to build the 5.5-mile stretch, however officials have discussed splitting the project into two phases. Anderson is also pushing for more action on the northern portion of the parkway. Friday he sent a letter to Gov. Rick Scott that asks the state leader to help find money to build the Ellis Road interchange and widen Ellis Road itself. Anderson wrote that the improved access through the two projects would make it more attractive for businesses to relocate to Melbourne International Airport and would help spur potential growth for the companies already at the airport. I’d like to thank the Brevard newcomer who wrote the recent letter, “Heritage Parkway project a boondoggle,” for offering his opinion, but after reading his letter I felt compelled to explain a little about our local history. Having lived here since 1988 and experiencing all the growing pains of Brevard, I can assure the writer the money for the parkway is well-spent. For once, we are trying to get slightly ahead of the curve with this new road instead of the standard operating procedure Brevard’s road construction usually follows. That is wait until a road is stuffed to 200 percent of capacity and then expand it for several years, causing unbelievable headaches. I’ve worked in outside sales since 1991, covering all of Brevard, and have had the pleasure of dealing with many road construction projects, most recently the widening of I-95 in Brevard. Most of these were massive undertakings causing many traffic issues and started years too late. So for once it is nice to see a proactive project instead of a reactive project. Ask the people who travel Minton Road between 7 and 9 a.m and 4 and 6 p.m. if they want that new road? Ask the people who want to get off I-95 in that 16-mile stretch from Fellsmere to Palm Bay if they want it. The letter writer may want to do a little more research in the future before calling a much-needed road project a “boondoggle”. More than $52 million that would kick off 7.5 miles of construction of the long-planned St. Johns Heritage Parkway in unincorporated Brevard County could be in hand late this year, according to county officials. On Tuesday, county commissioners will ask the federal Department of Transportation to earmark $31 million for the project. It’s anticipated those funds will be awarded by November, said county planner Stuart Buchanan. Combined with $17 million already set aside for the project, and an additional $4.5 million in federal funds for right-of-way acquisition and mitigation, the county would have $52.5 million to start turning dirt, officials said. The two-lane St. Johns Heritage Parkway, which would mostly parallel Interstate 95 from an interchange at Ellis Road to an interchange at Micco Road, has been in the planning stages since the mid-1990s. Brevard County Public Works Director John Denninghoff said once funding is available, construction — beginning at the intersection of John Rodes Boulevard and Ellis Road — could begin within a three- or four-month time frame. “We are at over 90 percent plan completion, pursuing all of our permits now and acquiring right-of-way now,” he said. The county project would link to a $9.6 million, 2.3-mile segment of the parkway project that runs from Malabar Road to Emerson Drive within the Palm Bay city limits. Another 0.7-mile project would extend the parkway from Emerson Drive north to the city limits. That construction is expected to be awarded this April, with work expected to take about 18 months, according to City Manager Sue Hann. 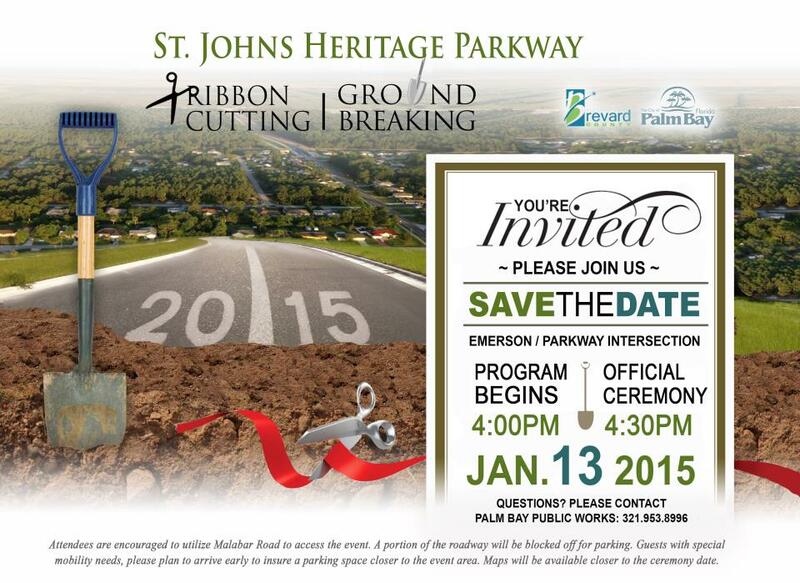 The St. Johns Heritage Parkway has been called the most ambitious road-building project in Brevard County. The project, according to planners, promotes long-term job creation by increasing access to Melbourne International Airport and such existing federal contractors as Harris Corp., Intersil Corp., Rockwell-Collins and Northrup-Grumman, and provides new access for 1,400 of undeveloped mixed-use property. Estimates for the complete 21-mile project have run as high as $200 million, but those numbers are somewhat flexible. “One of the difficulties about answering how much it will cost is that there are so many parts you have to be careful. If we did nothing else but this first phase, you’d have a very good project justifiable to itself,” Denninghoff said. Contact Walker at 321-242-3527 or dwalker@floridatoday.com. VIERA — The northernmost portion of the St. Johns Heritage Parkway in Melbourne and Palm Bay will deliver $2.41 in benefitsto motorists for every $1 spent on construction, a new study shows. These benefits include estimated travel-time savings and reduced vehicle operating costs generated by future highway’s 6-mile stretch linking Ellis Road in Melbourne with Emerson Drive in Palm Bay. “This is new information on the parkway, first of all. This is not information we’ve had before,” said Bob Kamm, executive director of the Space Coast Transportation Planning Organization. TPO officials hope this cost-benefit analysis helps secure a federal construction grant for the segment. Estimated construction cost is $49.8 million, and Brevard County officials have set aside $17 million for the project. 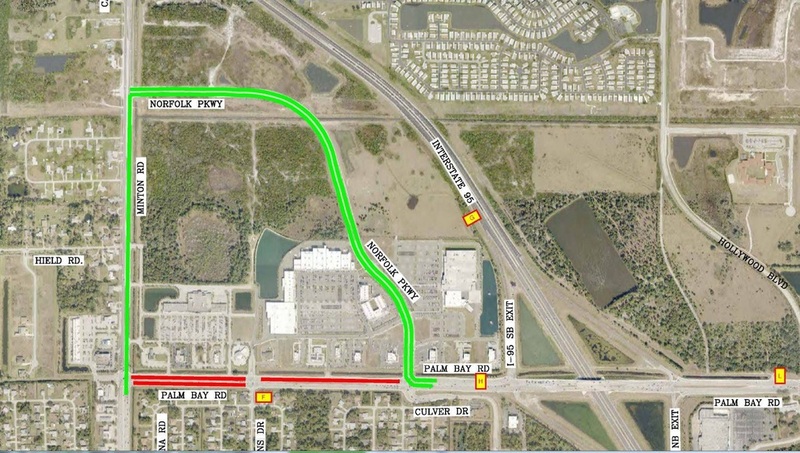 Eventually, the St. Johns Heritage Parkway may swing southward from Ellis Road to a proposed I-95 interchange near Micco Road, opening large portions of southern Brevard County to development. $7.8 million in travel time savings. Planners multiplied work-commute time savings by $10 an hour, or half of the Palm Bay average household income. $277,000 in vehicle operating costs. This includes fuel ($3.43 per gallon), oil, tires, maintenance and vehicle depreciation. Other benefits that cannot be quantified include improved police, fire and EMS response times; property value increases; and job creation, said Nick Lepp, a senior transportation planner with the Orlando firm that conducted the study. During Thursday’s TPO meeting, Titusville Mayor Jim Tulley questioned whether the $7.8 million time-savings projection was realistic. “Most people don’t get paid for their travel time to and from work,” Tulley said. Lepp replied that his study assigned value to drivers’ lost free time, and Commissioner Andy Anderson said some commuters have to shoulder child-care costs. The projected $49.8 million price tag does not include construction of an Interstate 95 interchange at Ellis Road, TPO Executive Director Bob Kamm said. Contact Neale at 321-242-3638 or rneale@floridatoday.com. skirt the western edge of South Brevard. said Sue Hann, city manager. county-built section that will link to U.S. This would get us out of here a lot faster and easier," Burrows said. ago, it's like we were trapped." project to meet federal standards. to take about 15 months. in an area that is currently not developed,"
Brevard County in making the full connection to U.S. 192, Hann said. and comes first," Hann added. of time and effort, but it's moving forward,"
don't have to come all the way to the east." the next in one way or another." NASA Boulevard from Wickham Road. north so it hits Ellis Road at Wickham Road. Road to Interstate 95 and link into the St.
"It's flowing really smoothly," he said. 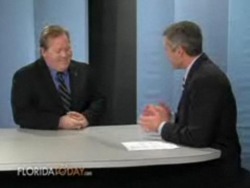 Watch Florida Today's Matt Reed interview County Commissioner Andy Anderson. There is significant discussion on the "Parkway!" Click LINK HERE. "No Build Option is Not an Option"
We regularly enunciate the positive impacts of the St Johns Heritage Parkway. For a moment, objectively and without political parochialism, let's consider what the financial and environmental costs of not building the parkway (aka “no build option”). To ensure accurate assumptions: formulas, matrix, acknowledgments and references will be enclosed herein... click here for study! Despite recent setbacks, the Heritage Parkway is a long overdue by-way that needs to be built. Even though it was first labeled a turkey, and then that status retracted - a lot of rumor and conjecture has surrounded the planning, design, and engineering of this road. It isn't wrong for people to be concerned. If you ever hear a politician tell you, "Don't Worry", be skeptical, of course. From the many different articles I have read and the recent research I have done on the parkway, I can tell you that the right people are involved and the project is being appropriately scrutinized and analyzed at all levels of government to ensure taxpayer money is being appropriately spent. I think it's wise that the impact to property owners will be nil as the tax money spent will likely come from Local Gas Option taxes (which in Florida is approximately 14.5 cents per gallon (cpg)). The project is desperately needed in Brevard County to provide much needed relief from I-95 and other major arteries that are constantly over capacity. Believe it or not, the parkway project has been a concept since at least 1988! Aren't people complaining that politicians never ask for their opinion? There have been several public meetings conducted by FDOT over this very parkway. This project is being carried out meticulously and with great detail. At this point, I don't see any points being overlooked. The environmental impacts have also been examined thoroughly by the FDOT and alternative corridors have been designed to minimize any damaging impact to wetlands and the environment. I'm confident that as this project has evolved over the past twenty years, that any potential pork barrel politics have been weeded out or altogether eliminated. In fact, this should be a bipartisan issue that many Brevard politicians should jump at because it only makes their overall constituency happier by providing better avenues of transportation across Brevard County. Brian Wilkins is a software engineer, Iraq war veteran and recipient of the Bronze Star. A graduate of Rocklege High and Florida Tech, he lives in Rockledge. The St. John’s Heritage Parkway< p> The County Commission room in Viera was packed on April 20th. Some were holding S.O.S. signs for Save Our Subdivision, and various city and county officials were nervously pacing in the back of the room. Speaker after speaker approached the podium to voice their opinions about the proposed 32-mile St. John’s Heritage Parkway that will skirt around Melbourne and Palm Bay. As explained by supporters, it was designed to ease congestion, offer an alternate route to I-95 during evacuations and above all, bring in construction jobs for years. Detractors were skeptical however and spoke of their concerns to the attentive commissioners stating they feared worse flooding in their swales and additional noise in their quiet subdivision of Brandywine. I could certainly understand their apprehension however at the last minute I put my name in to speak. My short speech went unrehearsed and I spoke from the heart. In the two decades that I have lived in Brevard County, I am both impressed and amazed at the progress that has been made at a speed unseen in many other states. Boston, Massachusetts came to mind as I recalled thousands of us trying to maneuver around that city every day during the “Big Dig.” It was a nightmare of catastrophic proportions. I told the commissioners that day that I had faith that the planners and developers would not suddenly forget how to build a parkway and with the complex set of checks and balances put in place, felt assured this parkway would be built correctly and with as little impact to the residents and environment as possible. In fact, preliminary tests and research actually show that the new parkway would in fact help the drainage issues west of I-95. Discussion had come up earlier about the Platt family and how much money they stood to make from selling their land. I didn’t address this that day but later gave it some thought. I say, good for the Platts, who were smart enough to purchase the land years ago in the first place. I also say, thanks to the Platts, for selling part of their land to the county because they could have said no and dragged this out for another decade. The Platt family at least went about it the right way by hiring engineers and surveyors to determine what the impact cost would be to them as they relocate their cattle, fencing and irrigation systems. This will not come cheaply I can assure you. It was agreed that the Platts can continue to use their land for agriculture until the county is ready to build so it seems that everyone worked together on this massive project and that’s refreshing. It has since occurred to me that it is always a good idea to buy land from a local family because they will usually pour that money right back into the local economy. And that’s a better idea than sending the money out of state or overseas. The Platts made $1.8 million for their land which equates to roughly $2.7 million for Brevard through ripple effects. Everyone wins. With a new high speed rail project underway and a new parkway on the horizon, Brevard County is looking quite impressive, I must say. Here in Palm Bay we look forward to the new thoroughfare with eagerness as we map out our own plans for growth in our city of 107,000 people. So while many may call us that “sleepy little town to the south,” I can assure you we aren’t so little and we certainly aren’t asleep. Stay tuned Brevard, you’re about to watch a transformation not typically seen during these economic times as we continue to grow to the south and west. We thank the Platts and we applaud the County Commissioners who have the foresight to continue with the growth plans by approving the new parkway. It will be a welcome addition to our city and our county. City leaders selected a 2-mile stretch passing Heritage High as the first section of a long-discussed parkway designed to loop around Palm Bay. The project marks the first time officials will turn dirt on the St. Johns Heritage Parkway, known as Palm Bay Parkway in the city, moving the road off paper and into reality. It also gives the public a second road on which to reach the high school, addressing a safety concern that arose when Heritage was built. "I think it would be a signature start to this project if we can serve a legitimate public need," Councilman Milo Zonka said. Overall, it will cost $5.2 million to build a two-lane road from Malabar Road to Pace Drive, which would be extended to meet the parkway. Palm Bay city staff will lay out the project in a proposal to the state Office of Tourism, Trade and Economic Development, which will draw down a $4 million grant allotted for the project the state's budget. Under that grant, Palm Bay will be reimbursed as the city spends money on the road. The city also will use transportation impact fees, money developers pay to offset the added traffic their projects bring to a community. City staff initially had recommended a different segment for the first construction of the parkway. That segment would have extended Pace and Emerson drives to the new parkway, creating a loop that increased the flow of traffic in the northwest quadrant of the city. That also would have helped developers build a proposed 60-acre commercial center that would have included retail and office space, City Manager Lee Feldman said. But those on the council who spoke Thursday night said the Malabar to Pace route was the better option. "I think this is the priority," Councilwoman Michele Paccione said. Preliminary designs for the segment will be complete by April, which will allow the city to seek construction-bid proposals, Feldman said. The city will also ask companies to give a cost estimate on building a section that extends the parkway to Emerson Drive. Eventually, the parkway will extend to the city's northern limits where it will meet with a county-built section of road that will link to U.S. 192. It's an important milestone for the parkway, which has been a top priority for Palm Bay and Brevard County, local officials say. 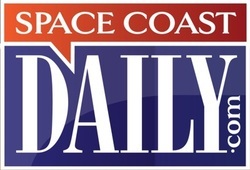 "It is nice to see a piece of the roadway is soon to be built," Space Coast Transportation Planning Organization director Bob Kamm said in an interview before Thursday's meeting. He has been working on the parkway since 1988. "It's been a dotted line on a map for 20 years and after seeing it through the planning stages for so long, it's always gratifying to actually see it come to fruition." Having one section of road under construction could help the city and county draw down more money for the parkway, said Tres Holton, a former Palm Bay councilman who is a consultant for a landowner who will benefit from the parkway. "Being shovel-ready opens a lot of doors for funding at the federal level," he said. "That's where the game-changer is." Contact Cervenka at 242-3632 or scervenka@floridatoday.com. The most ambitious road-building project for Brevard County in decades so far has little of the right-of-way needed and less than one-fifth of the money to build it. Yet, construction of the first phase of the St. Johns Heritage Parkway around Palm Bay could begin by this time next year if the county can strike deals for enough parcels of land along a first phase of the route. Officials just landed the first state earmarks for construction, money they hope can be leveraged to attract still more Congressional earmarks. While pitching a congestion-easing highway for commuters, leaders from the city of Palm Bay and Brevard County government continue to negotiate with developers and landowners in their jurisdictions. "It's like eating an elephant," said John Denninghoff, the county's traffic planning engineer and chief right of way negotiator. "You eat it one bite at a time." A FLORIDA TODAY review of the project found that getting the deals done has meant reshaping the future roadway from a free-flowing beltway around southern and western Palm Bay to an artery with developer-pleasing stoplights and intersections. The roadway's financial benefits to landowners along the proposed route are great enough that one has hired his own lobbyist to promote the roadway and secure federal and state dollars for the project. Meanwhile, taxpayers and commuters throughout Brevard County will be affected by the project's impact on other road budgets. The parkway now ranks as the Space Coast Transportation Planning Organization's No. 1 funding priority. At $200 million, the parkway could consume much of the money Brevard receives from taxes, grants and federal earmarks for years to come -- money that otherwise would be spent on roads elsewhere. Adding to the challenge, city and county leaders so far have rejected the idea of opening the parkway as a toll road. That approach paid for the Pineda Causeway between 1971-1989 and the Beachline Expressway through Brevard from 1963-1998. Officials are gambling that once they start the project, the money to finish it will come. Supporters say it will benefit the public with better roads, less congestion, new development and more tax revenue for the county and cities of Palm Bay, Melbourne and West Melbourne. "Their payback is access . . . however that property gets developed," Palm Bay Councilman Milo Zonka said. "The parkway's payback is those houses will pay impact fees, which then can be used to kick a two-lane into a four-lane. It's almost like you need a spark to start the process, and then it's self-fulfilling. Access creates development, which then creates more access." All but one county commissioner supports the parkway project. "I can't justify spending money on a new road when we don't have revenue to maintain our current roads," Commissioner Robin Fisher of Titusville said. The parkway has appeared on county planners' priority list for at least 15 years. It moved to the top recently after the county launched other urgent projects including the Pineda Causeway Extension, the realignment of Ellis Road and the extension of Apollo Boulevard. The parkway is the only new highway on the project list. It is as ambitious as anything ever planned in Brevard: 21 miles of highway along the western edge of southern Brevard County and connected at two interchanges to Interstate 95 -- one at Ellis Road near Melbourne and the other near Micco Road south of Palm Bay. The complexity of the project and a scarcity of money forced city and county planners to focus on an initial, manageable phase of the project. That 6.5-mile stretch connects the west end of Malabar Road near Heritage High School to U.S. 192 just west of Interstate 95. That will ease some congestion and provide a route out of northwest Palm Bay in the event of fires or floods, supporters say. "We would like to get the roadway from Malabar to U.S. 192 built as soon as we could," said Space Coast TPO Director Bob Kamm. Palm Bay officials expect to begin construction on their portion next year. The county would break ground on its portion in 2012. Simply connecting Malabar to Emerson, the initial city segment, would provide relief for commuters in western Palm Bay, regardless of when the county starts its portion, Deputy City Manager Sue Hann said. "The pattern now is that everyone goes east in the morning," she said. The promise for landowners: Access to a major thoroughfare for new homes and businesses. Parts of cow pastures will become prime commercial property at intersections spaced at one-mile intervals between U.S. 192 and Malabar Road. "People were supposed to be able to zip through to Palm Bay," Commissioner Fisher said. "This gives them four corners to sell off and make a profit." Among the owners who seems to understand the economic benefits is William "Tuck" Ferrell, scion of a ranching family that once ranked among Brevard's largest property holders. His acreage lies just south of U.S. 192. A former West Melbourne planning and zoning board member, Ferrell has become one of the parkway's biggest promoters. Ferrell hired Tres Holton, a former Palm Bay councilman and Brevard County commissioner's aide, as a personal public relations consultant and to lobby for money for the project in Tallahassee and Washington. An affable man who often wears a straw cowboy hat, Ferrell was born in Virginia but spent most of his life in Brevard, riding horses, raising cattle, and listening to former County Commissioner Joe Wickham explain his vision for an interconnected road system. Ferrell's family has donated undeveloped parcels to help build the Pineda Causeway extension and Apollo Boulevard, among other projects. For now, the land he envisions as part of the parkway is home to about 180 head of cattle, he said. Ferrell says he only wants better roads. But his negotiations with county transportation engineers for right of way through his 286 acres indicate he plans an "urban village" on his land. It would include a mix of homes, businesses and a hotel. Ferrell hopes to secure plans for an intersection on his property. Ferrell attends nearly every local TPO meeting, and can often be spotted at county and city meetings where the parkway is discussed. "Nobody wants to come to a county that has a road system with lack of connectivity," Ferrell said. "People want a viable transportation system, bring jobs to the county." Parkway deals also can bring side benefits to landowners. For example, the county's contract with the Platts calls for taxpayers to buy fill dirt from the owners at fair market value. Growth plans for the Platt property, which sprawls over 8,193 acres, call for up to three intersections to serve 4,670 homes and a mix of business and industry. "Each one of those intersections gives the Platts four corners to sell off and make a profit," Commissioner Fisher said. To start the first phase, the county still must acquire a hodgepodge of parcels between western Palm Bay and I-95 west of Melbourne. Today, the four key parcels between the Platt land and U.S. 192 are dotted with scrub, palms and cattle. They include a failed development now in foreclosure and another parcel owned by a member of the Platt family. The county also is negotiating with two owners between 192 and the proposed Ellis Road interchange who had planned to develop their wetland-dotted properties into subdivisions and an RV park. "We have had verbal offers to donate," Kamm said. Denninghoff, the county's land acquisitions expert, said it takes patience to deal with landowners seeking best value for their money in a depressed real estate market. Some would rather wait to sell until prices rebound. Recently, the county approved a contract for five acres from a failed development north of the Platt Ranch. Denninghoff is still negotiating with Ferrell and Walter "Toby" Platt for enough parkway land to reach U.S. 192 from the south. He also is talking with owners of a planned 195-home subdivision and the owner of the Spring Lake RV Resort for the northern stretch between U.S. 192 to the proposed I-95 interchange at Ellis Road. Still, the project remains far short of the money needed for completion. Local taxes won't cover it, and the idea of a toll road has gained no traction. As they have in years past, officials are counting on lobbyists to win state and federal road money. Palm Bay has secured $5 million in federal earmarks and will receive a $4 million earmark from the state Legislature in this year's budget. Local leaders have appealed to Sen. Bill Nelson, D-Orlando, and Rep. Bill Posey, R-Rockledge, in hopes of securing more federal dollars over the next 18 months. However, Posey -- who represents the area -- has joined a House Republican ban on earmarks for the 2011 budget and has requested none. The federal government could help most with the two interchanges at I-95. Design alone will cost $3.5 million for the south interchange at Micco Road and $2.5 million for the north interchange at Ellis. Building them would cost $25 million each. It's important to complete federal planning requirements, Kamm said, "so we're in a position to get earmarked money cleanly." Parkway leaders hope to close much of the gap through contributions from real estate interests. "Half or more could be from the private sector," Kamm said. Contact Schweers at 242-3668 or jschweers@floridatoday.com. Florida's stretch of Interstate 95 and Interstate 4 are among the deadliest highways in the nation, The Daily Beast website found when it ranked the roads based on federal figures. The 382 miles of I-95 running the length of the state have the worst rate of deadly accidents in the United States, while I-4 comes in third, the website calculated from five years of highway fatality data from the National Highway Traffic Safety Administration. The Daily Beast divided each interstate into stretches within states, tallied fatal crashes, and then divided the figure by the number of miles of that state's leg. The website measured fatal accidents rather than total fatalities. According to the analysis, there were 662 fatal accidents on I-95 in Florida from 2004 to 2008. That means there were 1.73 fatal crashes per mile. The website said there were 209 fatal crashes on the 132-mile I-4 during the same period. That comes out to 1.58 fatal accidents per mile. Florida Highway Patrol spokeswoman Sgt. Kim Montes was critical of the website's methodology, which she said does not look at how many vehicles travel the highways. "You compare 95 in Florida with a road in North Dakota, and I think you're comparing apples to oranges," she said. I-95 is the busiest interstate in Florida. And I-4 is likely the most congested interstate in Central and North Florida, Montes said. "Thousands of drivers navigate that drive every day and never crash," she said. "Unfortunately, the majority of our fatal crashes are driver error." Speed is a major factor in a lot of fatal accidents, Montes said. Some drivers exceed the speed limit by as much as 30 mph, she said. "Maybe they feel like they're not doing anything wrong," Montes said. "But unfortunately, when you look at a common denominator [in fatal crashes] … speed plays a factor." Steve Olson, a Florida Department of Transportationspokesman, said what makes I-4 and I-95 unique is the variety of drivers: local commuters, tourists and long-haul truck drivers. He said his agency works with law enforcement and uses tools — such as the electronic, adjustable speed limit signs on I-4 — to help keep highways safe and flowing. But a lot of times, people just feel as though they can drive faster than the speed limit, he said. "The trick is to adjust people's behavior," Olson said. Amy L. Edwards can be reached ataledwards@orlandosentinel.com or 407-420-5735. VIERA — -- Construction of a new Interstate 95 interchange near Micco Road will spur economic development and improve vehicle access across a sizable surrounding region, transportation officials believe. "This interchange, we're finding, rearranges the traffic in south Brevard -- anything from Malabar south, even into north Indian River County," said Bob Kamm, director of the Space Coast Transportation Planning Organization. "The presence of an interchange, where there is not (one) in a 17-mile stretch, really causes traffic to go about in different ways," Kamm said. Thursday morning, TPO officials received updates on the project, which may someday serve as the southern terminus of the long-discussed St. Johns Heritage Parkway. This controlled-access highway would swing west of I-95 and loop northward, linking with a second interchange at Ellis Road in Melbourne. The proposed southern interchange site is just south of the Grant-Valkaria town limits at I-95 Milepost 6.1, roughly 2 miles north of Micco Road. Also included in the Florida Department of Transportation project: Construction of a 4-mile connector road, bending around the borders of the 1,322-acre Micco Scrub Sanctuary. This road would link the interchange with Babcock Street and Micco Road. Public input will be collected during meetings in late August and early March, DOT records show. A design study may wrap up next June. Construction remains years off. Kamm said the interchange will help Brevard County Fire Station 86 near Barefoot Bay respond faster to I-95 accidents -- today, ambulance crews have to travel up to Malabar Road to access the interstate. Study also continues on the St. Johns Heritage Parkway northern interchange at Ellis Road, immediately south of Lamplighter Village. That project will also widen Ellis to four lanes, providing straight-line access from I-95 to Melbourne International Airport. Lance Decuir, DOT project manager, said widening Ellis Road eastward to Wickham Road will pose engineering obstacles. "There are 60 side street-driveway connections, which will be major issues for the life of the project," Decuir said. "Deep ditches along the edge of the roadway there. Tight right-of-way there." Design work may wrap up within two years, and right-of-way acquisition could be finished four years, Decuir said. The Legislature earmarked $4 million for St. Johns Heritage Parkway development in its newly adopted budget, said Leigh Holt, county government relations manager. Contact Neale at 242-3638 or rneale@floridatoday.com. The city council agreed to a $1.25 million deal to acquire a "critical" piece for the long-planned http://www.floridatoday.com/baybulletin Palm Bay Parkway. The deal with Lennar Homes includes roughly 90 acres of right-of-way and easements needed to extend the parkway from Malabar Road to the city's northern limits. 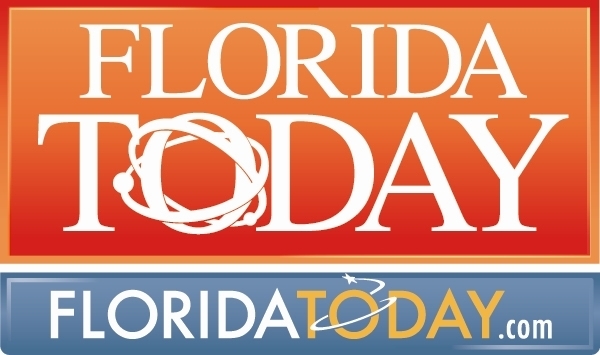 "This piece is significant in that it is critical to connecting Malabar Road to U.S. 192," Palm Bay City Manager Lee Feldman said. Once built, the four-lane parkway will give the county a route linking Micco and Melbourne, with two new interchanges on Interstate 95. Money for the deal will come from transportation impact fees, which developers pay to mitigate the effect their projects have on the community. In addition to the right-of-way for the parkway itself, the deal includes rights-of-way to extend Emerson and Pace drives to the parkway, and storm water ponds and easements. Lennar will give the city the engineering designs and permits it has been working on for the parkway and two other roads. Palm Bay also will be able to buy fill dirt for the parkway from Lennar at $2 per cubic yard. Palm Bay is expected to close on the deal by Jan. 31. This deal comes less than a month after the Brevard County Commission approved a $1.8 million contract with the Platt family for 47 acres of right-of-way. The Platt land abuts the Lennar land to the north. The road, known outside the city as St. Johns Heritage Parkway, will wrap around the southern and western part of Palm Bay and the western part of West Melbourne and Melbourne. County leaders hope the parkway will relieve traffic on the interstate and Babcock Street as well as providing a hurricane evacuation route for southern Brevard. Chamber of Commerce Supports the Parkway! MELBOURNE REGIONAL CHAMBER OF EAST CENTRAL FLORIDA, INC. RESOLUTION: The Melbourne Regional Chamber of East Central Florida, Inc. supports the construction of the proposed St. Johns Heritage Parkway. The Chamber has long supported effective transportation solutions for the region, and the Parkway would achieve several positive benefits: alleviation of traffic congestion and providing an additional emergency evacuation route for the Palm Bay area. We therefore encourage all parties to negotiate acceptable agreements and urge federal agencies to support the project in their transportation budgets. If you think building the pyramids was a chore, consider the St. Johns Heritage Parkway in South Brevard. The proposed road — formerly called the Palm Bay Parkway — has been planned for more than a decade, but no one has a clue when it will be built. Meanwhile, its need remains acute. The parkway would alleviate worsening traffic in the Palm Bay, West Melbourne and Melbourne areas, improve hurricane evacuation and become part of an expanded Central Florida road network to meet regional growth. It’s estimated $360 million price has long been the problem, although advocates say lower construction costs that have been caused by the recession could reduce the cost significantly. Either way, supporters are right to keep seeking funds through efforts such as a recent lobbying trip that had them knocking on the doors of Congress, including the offices of Space Coast Reps. Bill Posey and Suzanne Kosmas, and other Florida members. Their goal is to get $77 million requested by Brevard County, Palm Bay and Melbourne included in an upcoming federal transportation bill. That remains an uphill fight. But supporters should stay aggressive and Posey and Kosmas should do everything possible to gain at least some money to keep pushing this boulder uphill. Cost estimates to build the long-discussed St. Johns Heritage Parkway have plummeted in recent months, thanks to tumbling construction costs. Last year, Brevard County officials publicly discussed prices ranging up to $200 million for the highway, plus $60 million to $80 million for two Interstate 95 interchanges. "It's going to be about $120 million for the whole project -- including the interchanges," said Tres Holton, a Palm Bay consultant promoting the project. Holton pegged potential costs for the initial parkway segment -- linking Malabar and Ellis roads -- at $54 million (with an interstate overpass) to $69 million (with an interchange). Last week, Holton and Dave Isnardi, chief legislative aide to Brevard County Commissioner Andy Anderson, spent three days in Washington, D.C., lobbying for road funding. The duo met with about 20 members of Congress or their staffers, Holton said. Included was a 40-minute joint session with U.S. Reps. Bill Posey, R-Rockledge and John Mica of Winter Park, the ranking Republican on the House transportation and infrastructure committee. They also met with House members Susanne Kosmas, D-New Smyrna Beach, and Connie Mack IV, R-Fort Myers. Isnardi said he emphasized the future road's significance as an evacuation route, citing hurricanes and the 2008 Mother's Day fires that burned about 4,000 acres in southern Brevard. "We had citizens trapped in their homes last year," Isnardi said of those wind-whipped firestorms. "We got everybody to understand what the parkway is and why we're building it." Brevard officials hope the upcoming federal transportation reauthorization bill includes funding for the parkway. The county, Melbourne and Palm Bay submitted three requests totaling more than $77 million. The fate of these requests remains unknown. Holton said fiery debate over President Barack Obama's health care reforms will probably postpone the bill into next year. The Obama administration favors an 18-month delay, saying lawmakers need that much time to resolve issues such as whether to raise fuel taxes or find some other means to fund transportation programs. Since April 2005, various governmental jurisdictions have approved at least $30 million for the project, according to Holton's research. Chief among them: the Brevard County Commission's pledge of $21 million in local option gas tax bonds in May 2007 for right-of-way acquisition, engineering and design. After design and land purchases are completed, permits must be secured. Holton hopes construction begins by early 2011. Holton was hired by Friends of the Parkway, an ad hoc organization of Space Coast landowners, business leaders and other officials. A former Palm Bay deputy mayor, Holton lost in the Republican primary in the Florida House District 30 race last fall. Isnardi went to Washington on personal time, Anderson said, and his trip was not financed using county funds. Information from Gannett Washington Bureau was used in this report. Contact Neale at 242-3638 or rneale@floridatoday.com. The following files are working files only.